Ontario County Tourism Launches "Christmas On Us"
If you have friends or family visiting for the holidays, make sure they enjoy a “Christmas On Us"! “Christmas On Us” is a special holiday promotion being offered by Ontario County hotels and Finger Lakes Visitors Connection. Visitors staying two nights at any of the participating hotels during Christmas will receive a third night free, as long as one of those nights is actually on Christmas. 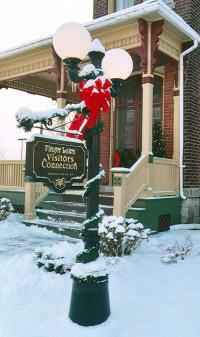 For reservations, visitors can contact the hotel of their choice and mention “Christmas On Us.” For more information, visit www.visitfingerlakes.com/christmasonus.